I had a wonderful few days in NY. It was a perfect balance of fun (spending time with my family) and work, which was also fun! Thank you to The Feed Feed, the Institute for Integrative Nutrition, Keri Glassman and Nutritious Life, and Real Simple Magazine for the great live collaborations. Hopefully you guys were able to catch some of the segments, but if not, my goal is to jump on Instagram Live from my kitchen today and/or tomorrow while I am cooking for Passover. I wanted to sneak a new recipe in before the weekend. 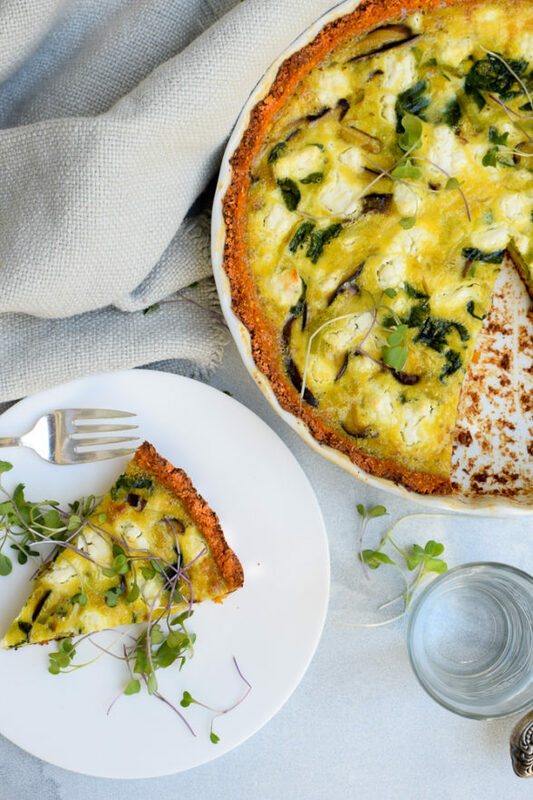 I am fairly sure that your Easter and Passover menus are locked in, but in case they’re not, this quiche with a sweet potato crust is perfection! I taught this last year in my classes and it was a surprise hit. 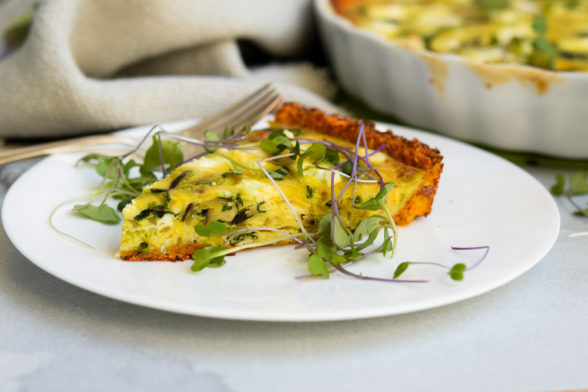 I say “surprise,” because a quiche crust made out of sweet potato is very alternative and not everyone is open-minded about breaking away from traditional recipes and formulas. As you know, sweet potato is one of my absolute favorite foods. They are so nutrient-dense, full of fiber and slow burning carbs, and can go both sweet and savory. It’s one of the only foods that can take on the flavor of any fat or oil perfectly. 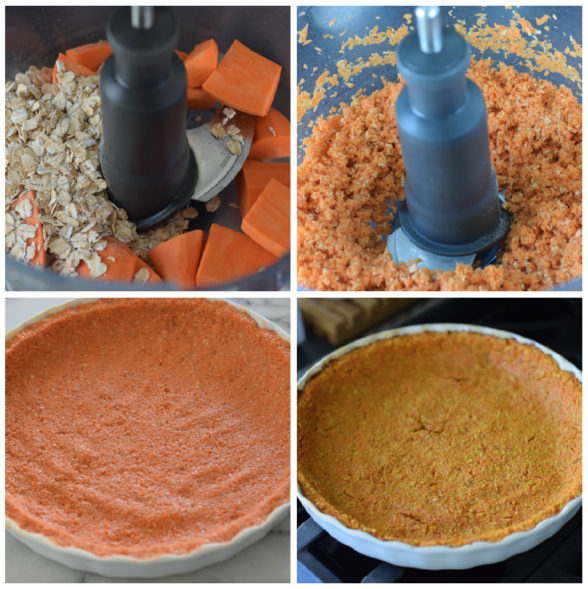 Just when I thought I exhausted all ways to use a sweet potato, I came up with this crust and not surprisingly, I am obsessed! Even if you don’t like the filling I am using, you can make the crust and fill it however you like. I chose some classic combos (leeks/mushrooms/spinach/goat cheese) here so that there was some familiarity with the flavors. But truthfully, the sweet potato in the crust is not a dominant flavor. It just provides a base and some texture against the soft, creamy egg filling. The colors are gorgeous, by the way. Anyway, I thought it would be perfect for Easter brunch or lunch. Or for any meal during Passover if you use the quinoa flakes option. Most people that I know who observe Passover think that quinoa is compliant. Ok, other breaking news — I have FINALLY uploaded my first online cooking class!! The technical side of all of this was way more challenging than I expected! I am offering the first class for a heavily discounted trial rate of $7 because I actually want your feedback more than anything and I want to be able to provide you with the knowledge and guidance you are looking for. I taped my January class and edited it down a bit. You have access to the video as well as the 5 recipes and I will also be setting up a private Facebook page for anyone who signs up for the class that I can be available to everyone in a communal setting, just like my classes. We can learn from each other’s questions and experiences. Click here to learn more and for the registration. I hope to see many of you in class! As always, tag me @pamelasalzman #pamelasalzman if you make anything from my book, my blog, and now, my online classes. It gives me the greatest joy to see your creations! Grease pan 9 or 10-inch quiche pan or pie plate with olive oil. Place sweet potato chunks and oats into a food processor. Pulse until finely chopped, like the consistency of rice. Add the egg and ½ teaspoon salt and pulse until the mixture is well combined and has a thick consistency. Spread mixture evenly onto the bottom of the prepared pan, and a little on the sides. Bake for 25-30 minutes until set and a little dry to the touch. Set aside. Reduce oven temperature to 350 degrees. While crust is baking, prepare the vegetable filling. Warm olive oil in a large skillet over medium heat. Add the sliced leek and shallot. Sauté until tender and translucent, about 5-7 minutes. Add the mushrooms, garlic, turmeric, cayenne pepper, and ¾ teaspoon salt. Continue to sauté for another 5-6 minutes or until the mushrooms have softened. Stir in spinach and remove from heat. 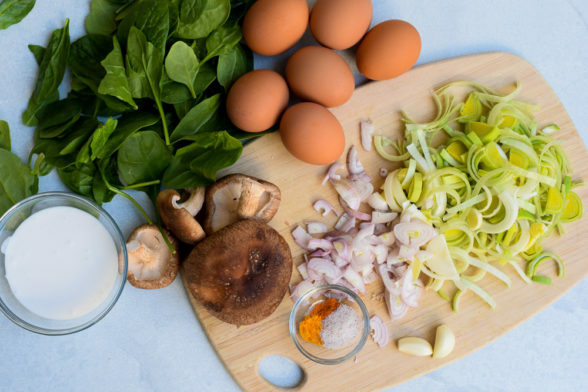 In a medium bowl, beat together eggs and coconut milk. Add the cooked vegetables to the egg mixture. Pour into the cooked pie crust and dot with goat cheese on top, if using. Bake (reminder: at 350 degrees) for 30-40 minutes or until the center is set and springy. Serve warm or at room temperature. Thanks so much for this recipe! I made it today, and it was so easy to put together and delicious! I use quinoa flakes in place of the oats if I make during Passover. Ancient Harvest is the brand I use in case you see it in the market. But GREAT idea to use matzoh! I’m hosting a large brunch this weekend and can’t wait to try this, especially because it’s Passover safe! I’m going to make 2 of them, but I have some heavy meat eaters (and mushroom haters). Do you think I could sub some kind of meat for the mushrooms (bacon? chicken sausage?)? Of course! 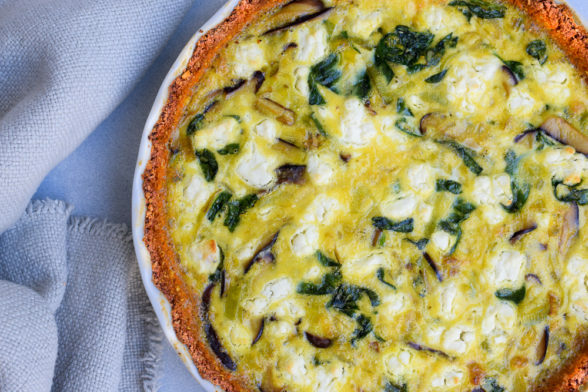 Literally, put your favorite frittata or quiche filling in there and it will turn out great. If you just want to make a swap of meat for mushrooms, go for it! Make sure you cook (veg or) meat before combining with beaten eggs though. Let me know if you have any questions. Oats are not kosher for Passover. Use a sheet & 1/2 in place of it broken up into the food processor & just follow the rest of the directions. It is great!! I made this as a simple dinner for my husband and and served with some dressed greens on the side and it was so delicious! 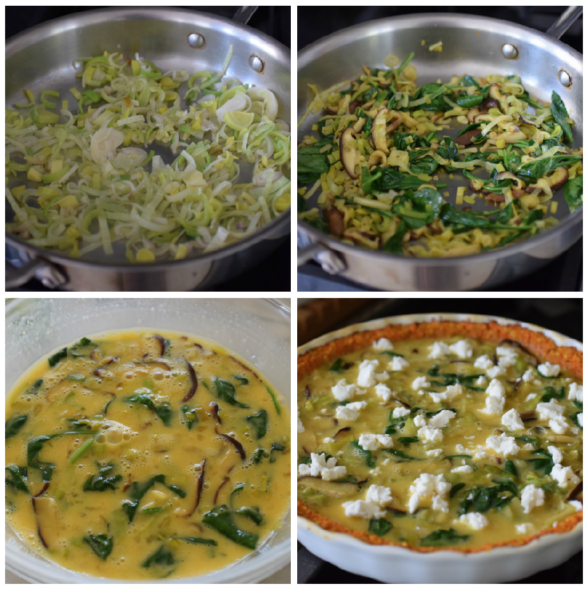 I loved the alternative to a regular crust and it was a nice way to try something a little different than a frittata all the time! Thank you for always thinking outside the box with flexible recipes for food substitutions. I am newly navigating living gluten free after being dairy free for almost a decade and have loved recently discovering your website and cookbook with so many great alternatives or substitutions! This sounds amazing! Can the sweet potato crust be made ahead of time, or the night before? I am so excited to try this. Could almond meal or flour be substituted for the oats? If so how much? I haven’t tried it, so I can’t be sure. But I would try swapping it for the oats one-for-one.